Water-resistant IMPP Composite Cone – Pioneer's popular injection molded polypylene (IMPP) cones produce outstanding mid-bass response and resist the effects of salt water, humidity and extreme heat. ¾" Poly-Imide Reflex Horn Tweeter – The Reflex Horn design is a Pioneer innovation that delivers stunning high frequencies while at the same time providing protection for the tweeter from moisture. Elastomer Surround – Each speaker utilizes an elastomer surround that resists color fading or running, which extends the longevity of the product. Acrylonitrile-Elastomer Styrene (AES) Glass Fiber Reinforced Basket/Magnet Cover – The AES cover protects the magnetic circuit that can affect the performance of the speaker. 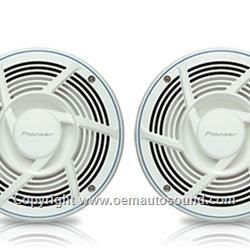 The speakers also sport the pure white AES grilles to resist fading and yellowing caused by direct sunlight and heat.